A Palestinian walks past a ceramic sign of a U.S. Agency for International Development (USAID) project in Hebron in the West Bank January 31, 2019. Photos: REUTERS/Mussa Qawasma. 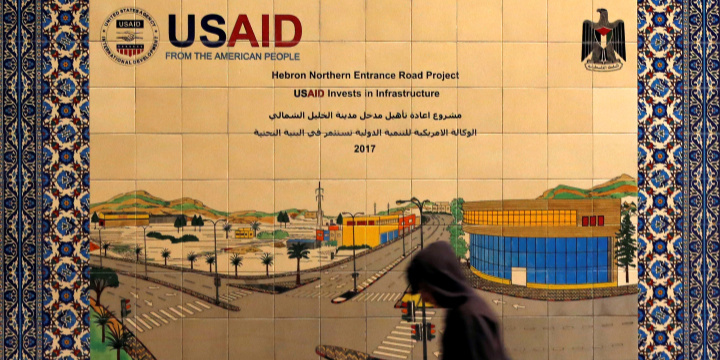 The US Agency for International Development (USAID) has ceased all assistance to Palestinians in the West Bank and Gaza, a US official said on Friday. President Donald Trump’s Middle East envoy, Jason Greenblatt, said the aid was cut at the request of the Palestinian Authority. “This aid was cut (not just suspended) at the PA’s request because they didn’t want to be subject to U.S. courts which would require them to pay U.S. citizens killed by Palestinian terrorists when the PA was found guilty,” he said in a tweet. “At the request of the Palestinian Authority, we have wound down certain projects and programs funded with assistance under the authorities specified in ATCA in the West Bank and Gaza,” a U.S. official told Reuters on Friday. Greenblatt called Rudeineh’s statement disingenuous. “Palestinians are too smart to continue to live as victims and recipients of foreign aid. Until a political solution is found (maybe it will be our peace plan? ), the PA must focus on helping Palestinians lead better lives,” he tweeted. In January the World Food Program cut food aid to about 190,000 Palestinians due to a shortage of funds.